Help us tell her story. Donate now to preserve the stories of servicewomen, educate the public on their contributions, and inspire future generations. Help the Women's Memorial preserve the stories of servicewomen, educate the public on their contributions, and inspire future generations. Through this campaign, Changing the Face of Courage, we aim to highlight the lives of individual servicewomen and ensure their sacrifices are not forgotten. More than three million women are serving or have served in the U.S. Armed Forces since the American Revolution, but the stories of these courageous patriots are often unknown. For the most part, history tells the stories of service members who were men, and the service of women goes unrecognized. 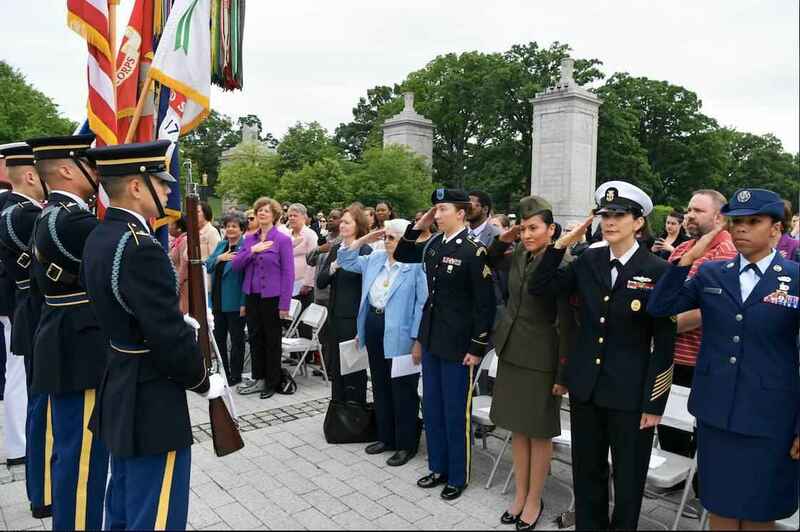 The Women In Military Service For America Memorial (WIMSA or Women's Memorial) is on a mission to change that. We aim to broaden our ideas of what courage looks like and open dialogue to explore how women contribute to making a safer and better world. Educate the American public about the roles and contributions of servicewomen, thereby honoring these women and preserving their legacy. This work is critical to America's well-being. It is important for national security, for the workforce, and for fostering our national identity as a country where anyone, regardless of gender, race, or socioeconomic status, can achieve their dreams. Join us: Please donate to WIMSA to support the creation of high-quality programs that preserve the history of women who've served, educate the public about their stories, sustain day-to-day operations at the Memorial, and inspire future generations to serve. I submit my donation with gratitude for our military and appreciation for the unique challenges military women face in service to their country. I am the proud daughter of a WWII WASP. I only wish I could donate more but I will continue to do so as much as I possibly can. To my sisters in arms. In honor of all who have served with special gratitude to General Gale S. Pollock who introduced me to this very special world of remarkable women! Women in the military have been ignored for many, many years and now we need to tell the public how we contributed to our armed forces. It's important to capture the history so those who come after will understand they have an obligation to continue to push forward. I donate because I have been blessed to retire from the Military despite many obstacles. I am proud of the women's memorial work. Private to Major, Proud to serve! I am proud to support the legacy of women's courage and leadership in our Armed Forces. Retired Navy WAVE (1966-69) and Naval Reserve (1985-2006), I support all women in the military and am proud to be part of all women who have served.